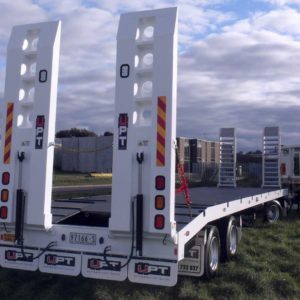 Our range of dog trailers will make a great addition to your fleet, if you already have a truck and tipping dog combination these trailers will give you the flexibility to offer more. Our 3 axle dog trailers are built strong to suit a number of applications. Designed in house and to the highest standards. We can also custom build your trailer to suit your needs. Upping the ante, this trailer improves the carrying capacity of your truck by distributing weight to the forward axle group. Carrying your large plant equipment has never been easier! Our 4 Axle Dog Trailers are built strong to suit a number of applications. Designed in house and to the highest standards. We can also custom build your trailer to suit your needs. The ultimate setup, this trailer gives versatility and stability. With a wide range of options available, we can build to suit your every need. From attachment housings to in deck wells, nothing is off limits. Take a look at our accessories page, the possibilities are endless. Don’t see what you’re after? Contact us to discuss your needs. We are also specialist bobcat trailer fabricators.